Devil May Cry 5 is in development by jeuxvideo.com . This in turn may raise some eyebrows, this fifth component of the series will be developed by Ninja Theory, a British studio behind Heavenly Sword. the Japanese publishers increasingly interested in work done by Western studios. Devil May Cry (デビル メイ クライ) is a series of four hack and slash video games set in the modern day, developed by Capcom and created by Hideki Kamiya. Originally intended to be a sequel in Capcom's Resident Evil series, Devil May Cry was such a radical departure from the series' style that it was developed into a new property entirely. 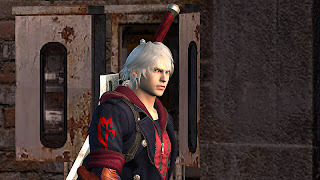 Devil May Cry has been cited as the origin of the 3D Hack-and-Slash sub-genre of video games followed by the Ninja Gaiden, Shinobi, and God of War series of video games. The series centers on main character Dante's goal of avenging his mother's murder by exterminating demons. The gameplay consists of heavy combat scenes in which the player must attempt to extend long chains of attacks while avoiding damage in order to exhibit stylized combat; this element along with time and amount of items collected and used are taken under consideration when grading the player's performance.